While the Countdown Sales Timer editor has a super-fly live preview of your timer, it doesn't truly depict how your timer will appear on your store with other competing popups, banners, and bits of code. If you've published your timer already, you can of course visit your store and see the timer for yourself, double-checking that everything looks amazing. But if you've only saved it, you'll need another way… and guess what? We built it right into your dashboard. Say hello to Countdown Sales Timer's "..." button. You'll find it on your dashboard, cozied up next to the EDIT button. Clicking on it will open up something we call the actions menu. 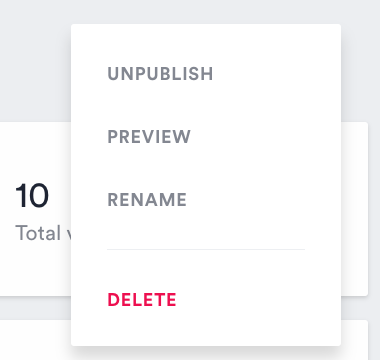 It's where you can do all kinds of cool stuff, like publish and unpublish, rename, delete, and, yes, preview. Clicking the Preview action will open a new tab or window in your browser with your store open and the timer displayed. Looks pretty good, right? If you like what you see, you can go back to the dashboard and publish it. Or, if you're still feeling shy, you can leave it unpublished and keep it as your little secret for a little longer. And that's how you preview a timer, folks!